This statement is objectively false. The recall provisions contained in the Wisconsin State Constitution were never intended to be limited in such a fashion. The original design of the right of recall is, in fact, intended to permit voters to recall elected officials for virtually any reason so long as the procedural mechanisms of the State Constitution are followed. A comprehensive history of the Recall Movement by Rod Farmer was published in 2001 in the New England Journal of History, entitled Power to the People: The Progressive Movement for the Recall, 1890-1920. Much of the following discussion draws upon the Farmer article, unless otherwise noted. The article is hosted on the website of the Initiative and Referendum Institute at the University of Southern California. A 1915 political science college textbook explained the recall this way: “In order to complete popular control over . . . government the recall has been adopted . . . [and] . . . it allows the voters to retire officials for any reason whatever which seems satisfactory to the electorate.” The recall rested upon the assumption that government officials should represent the direct will of the citizens. Senator La Follettte has favored and now favors the recall. By the recall, a faithless public official may be retired without waiting for the evil to be fully consummated. Under such a law, the public official will no longer betray his constituency. Party platforms will mean party performance. Downward revision of the tariff in the platform will not mean upward revision in accomplishment. The official will no longer rely on the people forgetting before election day rolls around. He will face the immediate dishonor he deserves. The broad nature of the recall power reflects its role as the intended remedy for a broken democracy. A desire to reform the democratic process in America lay at the core of the Progressive Movement in America. Progressives wanted to strengthen the control of the people over the levers of government, while reducing the influence of the special interests, and the recall power was one way of accomplishing this goal. Farmer reminds us that the term “Progressive” was an umbrella designation that included persons with many diverse motivations: Protestants demanding social justice for the poor, religious moralists opposed to alcohol consumption, and “good government” political reformers. (Farmer, pp. 4-5). Many contemporary critics like to attack the Progressives for their economic policies. However, only some Progressives focused on economic reforms. The uniting thread among the various factions within the Progressive Movement was the view that government in the United States had become systematically corrupt. Their common remedy was to install mechanisms into the very structure of government that would increase the role of popular democracy. Progressives exalted the federal and state constitutions, with their delegations of authority to elected legislators and executives, as the only legitimate vehicle for making and enforcing the law. However, when they looked at how the constitutionally created organs of government were actually being operated during the late nineteenth and early twentieth centuries – as opposed to how they were designed to operate — they saw that the real power of government was being exercised behind the scenes, and not by the people’s elected representatives. Legislative policy choices were being made in back rooms, out of the public eye, by political party bosses and corporate interests. Ready-made legislation was often brought to the floor of the legislature for quick approval, before the public was informed of the content of the bill or given an opportunity to comment. While lobbyists had a seat at the table, ordinary citizens were left with no power to influence policy. [This secretive union of corporate lobbyists and political interests, and the exclusion of public participation in the drafting of legislation, is echoed in the current day activities of the American Legislative Exchange Council (ALEC)]. We have spent many days in discussing the powers of this and that and the other officer. What is the government of this state? What has it been during the forty years of my acquaintance with it? The government of the Constitution? Oh no; not half the time, or half way . . . From the days of Fenton and Conkling, and Arthur and Cornell, and Platt, from the days of David B. Hill, down to the present time the government of the State [of New York] has presented two different lines of activity, one of the constitutional and statutory officers of the State, and the other of the party leaders . . . They call the system . . . invisible government. For I don’t know how many years Mr. Conkling was the supreme ruler in this State; the Governor did not count, the legislatures did not count; comptrollers and secretaries of state and what not did not count . . . Then Mr. Platt ruled the State; for nigh upon twenty years he ruled it. It was not the Governor; it was not the Legislature; it was not any elected officers; it was Mr. Platt. And the capitol was not here; it was at 49 Broadway: Mr. Platt and his lieutenants . . . The ruler of the State during the greater part of the forty years of my acquaintance with the State government has not been any man authorized by the Constitution or by the law. Within a modern democracy, the ultimate normative objective is mass political inclusion: ‘[E]very individual potentially affected by a decision should have an equal opportunity to influence the decision . . . [C]ollective actions should reflect the purposes decided under inclusive processes.’ These sentiments were amply on display during the Populist and Progressive eras in American politics, as reformers extended the voting franchise, instituted direct primaries, and increased the number of elective offices; anything less than these reforms, it was said, would imply “corruption.” The principle of democratic inclusion remains a touchstone today. Under this much broader conceptualization of political corruption, many common activities in a system of liberal representation – backroom deal-making and logrolling, the mobilization of particular factions to further one’s political causes, brazen appeals to partisanship, for example – might be called into question. Other Progressive Era reforms included efforts to extend the franchise and widen the voting base, the successful push for the direct election of Senators by the people, and transparency provisions such as “sunshine” laws that required the prompt public notice of new laws and guaranteed public access to legislative proceedings. The elimination of the patronage system, whereby government workers were often hired and fired based upon political affiliation, was also an important element of Progressive Era reform. It is worth pausing for a moment in order to consider how many of these “good government” reforms are presently in the process of being rolled back, through voter ID laws, reduced public access to the legislature, and loose interpretations of public notice. Far from being a radical invention of the Progressives, the broad power to recall public officials has venerable roots in American history. One early antecedent was the practice, common in the colonial era, of town meetings whereby residents met in order to issue instructions to the town’s representative in the legislature. While the representative’s instructions were sometimes labeled advisory, in many towns the instructions to the representative were considered mandatory. The widespread use of instructions in the colonies during this period paralleled reform efforts underway in England at that same time that sought to make members of Parliament subject to mandatory instructions from their constituents. After the Revolution, the Articles of Confederation provided that the states had the power to recall their representatives to the national government, although this recall power was lodged in the state legislatures and not directly in the hands of the electorate. Nonetheless, when the United States Constitution was drafted, many delegates at the Constitutional Convention objected that the new Constitution did not provide the same recall provisions for congressmen as did the Articles of Confederation. Luther Martin, in particular, feared that the six year term of Senators was too long and would leave Senators unaccountable to the people unless a recall provision was added to the text. The federal Constitution of 1789 ultimately did not contain any recall provisions, nor did it provide for the right of state legislatures to issue mandatory instructions to their federal representatives. The absence of these provisions reflects the desire on the part of the drafters to give federal representatives the freedom to promote national interests without being beholden to local pressure. However, the desire to advance these federalism principles in the United States Constitution should not be read as a rejection of the use of the recall power when it is exercised at the state level. In the nineteenth century, first the Populists and then the Progressives picked up on the idea of the recall as a way for the public to hold legislators accountable. The Recall Movement gathered strength after Los Angeles became the first major U.S. city to include a recall provision in its city charter in 1903. In 1908, Oregon became the first state to include recall provisions in its constitution. Wisconsin was one of the last states to adopt a recall provision in 1926, by which time the Progressive Movement had run its course. Supporters of the recall power argued that its foundation lay in the sovereign power of the people. They assumed that the role of the elected official was the role of a delegate, whose duty was to give effect to the opinion of his district and not to exercise his own judgment. Far from being radical, supporters thought that the recall was necessary in order to “restore popular government to the people by destroying the control of private influences over legislative bodies” (Farmer, p. 14, quoting a 1911 author). Political history in our country has always recognized the primacy of the sovereign people, but what had changed in the opinion of the Progressives was the growth of corporations and special interests that had captured the legislature. Opponents of the Recall Movement resisted state constitutional amendments on the grounds that the recall power would lead to political instability. They charged that constant recall elections would lead to a form of “perpetual warfare” between political parties. They also charged that recall supporters were socialists who were engaged in class warfare against the educated, property-holding portion of the population. (Farmer, p. 20). In Wisconsin, as well as in many other states, the voters rejected these arguments in opposition to the recall power and proceeded to make the right of recall a part of the fundamental law of the state. After arguing that the language creating the recall power was too broad, and too radical, those who had opposed the adoption of the recall power modified their argument. Now they claimed that the same language that they had previously criticized for being too broad was, in fact, intended to be construed narrowly, so that recall elections would only take place in those rare instances when candidates had committed serious criminal or ethical transgressions. There are not a few public men who, though they would repel with indignation an offer of a bribe, will give certain corporations special legislative and executive privileges because they have contributed heavily to campaign funds; will permit loose and extravagant work because a contractor has political influence; or, at any rate, will permit a public servant to take public money without rendering an adequate return, by conniving at inefficient service on the part of men who are protected by prominent party leaders. Various degrees of moral guilt are involved in the multitudinous actions of this kind; but, after all, directly or indirectly, every such case comes dangerously near the border-line of the commandment which, in forbidding theft, certainly by implication forbids the connivance at theft, or the failure to punish it. The term ‘corruption’ generally was understood [by the Framers] . . . to mean not merely theft . . . . but the use of government power and assets to benefit localities or other special interests (in essence, ‘factions’). . . . Corruption existed when a narrow benefit was sought and received – the mental attitude and approach towards government was intrinsic to the definition. If some modern readers find Roosevelt’s broad usage of the word “corruption” to be confusing, that may be because a handful of Supreme Court Justices have recently embarked upon a campaign to re-define that word. Intent on advancing the non-originalist idea that corporations have a right of free speech under the First Amendment, these judges have argued that the word “corruption” can only be understood to apply to acts of bribery involving elected officials, where some sort of quid pro quo of cash for specific performance is alleged to have taken place. As summarized by Professor Zephyr Teachout, “[i]n a handful of cases, and for a handful of Justices, corruption is basically coextensive with the criminal law statutory definition of bribery and ‘political corruption’ – a view coming out of some (probably) careless writing in [Buckley v. Valeo].” (Teachout, p. 388). In Buckley, the majority opinion of the Court had mentioned the quid pro quo form of political bribery as one type of corruption. Later, in the Citizens Against Rent Control case, Chief Justice Burger would cite Buckley as holding that bribery was the only form of corruption that justified laws restricting free speech in the context of political campaigns. Justice Kennedy picked up on this point in McConnell v. FEC. By the time of the Citizens United case, the idea that corruption could only be defined in the narrow sense of bribery of elected officials became one of the cornerstones in an opinion by five Justices that struck down campaign finance laws that restricted corporate spending. (Teachout, pp. 388-389). It is a mistake to read the pervasive denunciation of corruption employed by the advocates of the recall power in the more limited sense that these current day conservative judges employ. To limit the word’s meaning in such a fashion is an anachronistic attempt to define deviant conduct downwards. Critics of the Supreme Court’s campaign finance decisions have called on the Court to abandon these efforts and return to the original meaning of the word corruption. However, regardless of the merits of current day attempts to re-define the word, it is clear that the drafters of the Wisconsin recall provisions understood corruption to encompass any conduct by public officials that advanced the objectives of special interests (especially corporate interests) at the expense of the common good. Not surprisingly, the actual text of Article XIII of the Wisconsin Constitution reflects the history outlined above. In a previous post, I listed the many reasons why the text of the Wisconsin Constitution itself is inconsistent with any limitation of the recall power to instances of criminal or ethical wrongdoing. First, the right of recall in Article XIII, Section 12, is guaranteed by the text without any limitation on the use of that power. We should not read a narrow limitation into the text without any language to support such a limitation. Second, instances of “corrupt conduct” or the commission of crimes and misdemeanors by elected officials is specifically made subject to the separate impeachment provisions of Article VII. We should not read a general grant of power to be duplicative of a more specialized constitutional provision, because it is improper to read any constitutional provisions as surplusage. Third, the differences between impeachment and recall are significant. Impeachment, for serious offenses, can occur quickly. Recall elections take a long time, and seem ill suited as a means of removing serious transgressors. By the same token, impeachment is a vehicle whereby legislators un-do the choice of the electorate, so it is appropriate to limit the impeachment power to serious offenses. In contrast, recall is the action of the electorate to un-do its own choice, thereby making a lower standard for removal appropriate. Finally, serious allegations of wrongdoing trigger due process rights to defend oneself, which is the case in an impeachment proceeding. The lack of a vehicle for the recalled official to defend himself in Article XIII indicates that the recall power is not dependent upon any allegation of wrongful conduct. It is a common technique of textualists to take language out of context in order to construct an alternative meaning wholly divorced from the original intent of the drafters. Fortunately, the text of the Wisconsin Constitution is sufficiently clear on this matter as to preclude any such mischief here. To be clear, it is perfectly appropriate to argue that the recall power contained within Article XIII of the Wisconsin Constitution is broadly available, but that it is a power best reserved for extreme violations of the public trust. This would be a statement concerning the circumstances under which a broad recall power should be used, as opposed to an assertion that it is improper to use the power at all. It is equally valid to make the opposing argument, which is that the recall power (and the mere threat of a recall) plays an important role in limiting potential abuses by those who exercise the public trust, and that therefore the electorate should utilize that power freely. This post is intended to clarify the broad scope of the recall power in general, not the wisdom of its use. People who argue that the recall provisions of the Wisconsin State Constitution were designed solely for the removal of elected officials who violate the criminal law, or who transgress formal ethical rules, are engaged in the worst form of historical revisionism. In so doing, these individuals degrade the public debate over the utility of recall elections, by denying the public a common basis of historical fact by which to measure current events. Constitutional provisions must be given their intended effect, and should not be interpreted out of existence by people who don’t like them. This requires judges, lawmakers and pundits to respect those Progressive elements that have been written into the Wisconsin Constitution because, as much as any other constitutional provision, they are the law of the land. 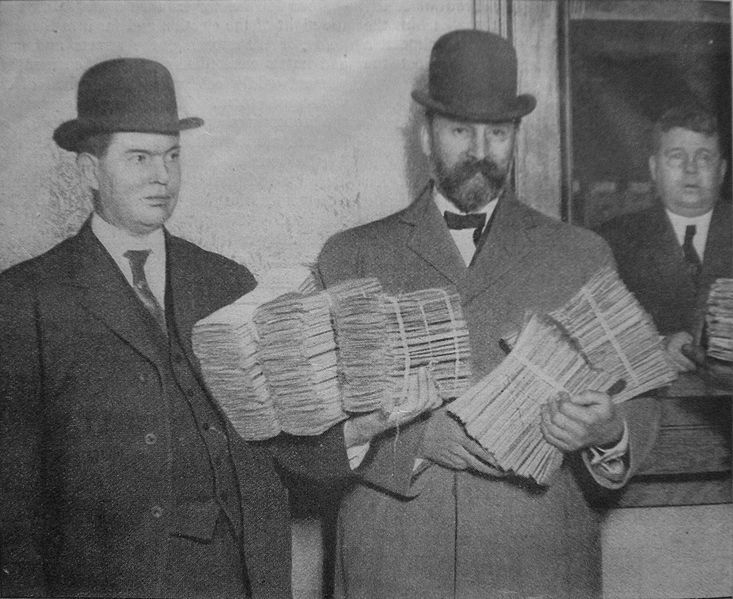 Photo: Voters submit petitions in 1910 to recall Seattle Mayor Hiram Gill. Gill was elected on an “open town” platform, and his administration tolerated widespread prostitution and gambling operations in the city. Despite being upfront about his policies, a recall drive was instituted against him. The grounds listed in the petition to recall Gill were 1) gross incompetence, 2) refusal to enforce the ordinances of the city, 3) lack of impartiality in appointing men to public office, and 4) allowing Seattle to become a home for criminals. See Mansel Blackford, “Reform Politics in Seattle During the Progressive Era,” 59 THE PACIFIC NORTHWEST QUARTERLY 177 (1968). Gill lost the recall vote, subsequently switched positions to become a “law and order” candidate, and was elected Mayor of Seattle again in 1914.